An artist reaches out to war-torn children with a love of art and a message of hope. >>> we're back this morning with our "sunday inspiration." 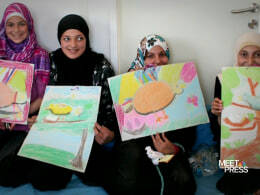 an artist from seattle is trying to bring a glimmer of hope to syrian children now living as refugees in jordan. jean bradbury is headed to the syria/jordan boarder to share her love of art in a project called studio sierra, which provides children's educational and art supplies to the displaced families. she does it in hopes that her workshops help the so-called forgotten children imagine a better future while giving them a reason to smile. >> you've got to teach these kids this, that they have it within their imaginations to make a better world than they've been handed, i hope.